This festival is held in August annually celebrating the life of local artist and sculpture Mike Kenny. His artistic air is represented locally through sign writing on many Shop fronts. He is best known for his bronze sculptings of Patrick O’Keeffe, Scartaglin 1984 Johnny O’Leary, Killarney 2007 Seán O’Ríada, Cúl Aodha Cork 2008. 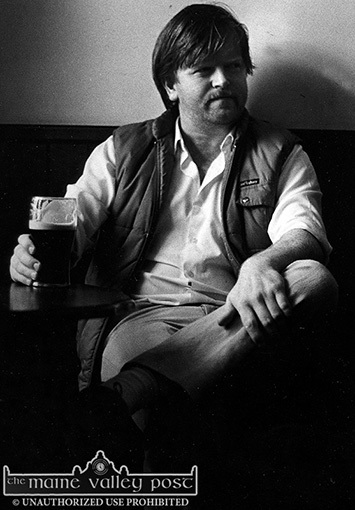 Five years to the weekend after his all too early passing in 2011, Mike Kenny, artist, sculptor, musician and singer – and more – is to be remembered in his home town with a two-day festival crammed with a bit of everything he loved. Behind the scenes are organisers, publican, Peter Browne and Ted Kenny – a cousin of the late Mr. Kenny’s. This truism comes to mind when we think of Mike Kenny. The biography of Mike’s life tells us only the marginal details of what he materially achieved. His degree in fine art from the National College of Art and Design enhanced his already bourgeoing creativity. Revelling in the company of others, Mike expounded a number of teaching roles with both children and adults. His calligraphy work dots the Kerry landscape in the form of various sign fronts. Mike had an insatiable curiosity for the world. His visiting Art lectureship in Des Moines, Iowa allowed him to explore the world of the native American Indians. Indigenous people’s and their worlds fascinated him. In fact all of life fascinated him. It is true that his creative expression was really elevated when he began to mould clay. He spoke with animation about art and in particular sculpture. The nuances and subtleties of understanding form and muscle drove his need for perfection. It had to be right. Evidence of this knowledge found expression in his sculptures of Patrick O’Keeffe in Scartaglin (1983), Johnny O’Leary in Killarney (2007) and Sean O’ Riada in Cul Aodha (2008). His understanding of the transience of the human body belied his deep spirituality and unparalleled belief in the after life. 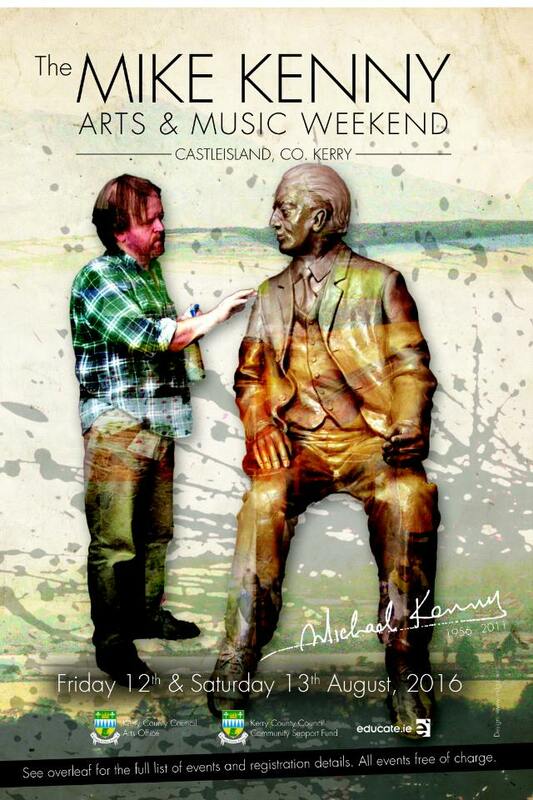 It is apt that his three fine Kerry sculptors should commemorate gifted Irish musicians, considering Mike’s deep love of traditional Irish music and his instrumental work in establishing the Patrick O’ Keeffe festival in 1993 in Castleisland. A keen historian, Mike co-founded the Castleisland and District Culture and Heritage Society in 2006 and wrote for the Kerry Archaeological Magazine. Quiz master and quiz player extraordinaire, he revelled in an erudite challenge and was as much at ease discussing cubism as he was Munster rugby. Humble and yet simultaneously proud, Mike had an ability to draw people towards him. His intensely social personality never masked the subtle and gentle man who lived by his own unique philosophy. Mike is the inspiration for this festival weekend, his life, work and creativity will be celebrated on the fifth anniverary of his death. As the sun sets on another Mike Kenny Weekend we are pleased to announce Eibhlín Broderick as the winner of the Young Musician Award. Eibhlín plays the fiddle and comes from a family of musicians & singers. 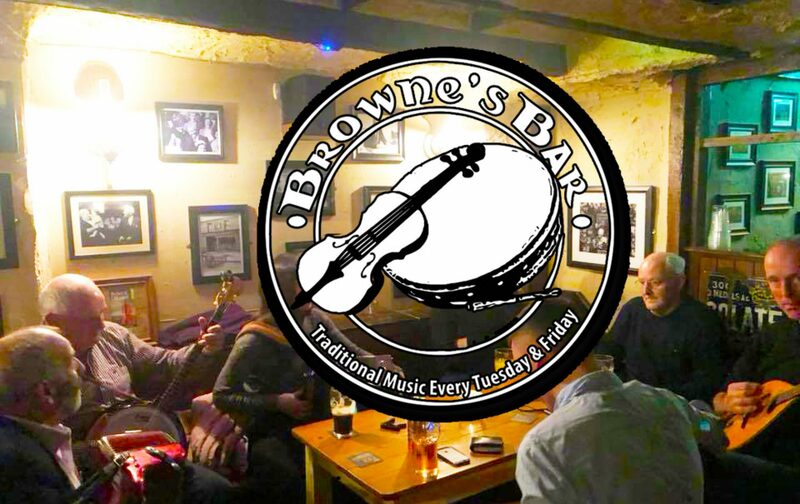 Artist Mick Davis held the children’s art workshop and renowned accordion player Donal Murphy & family took the Friday night session in Brownes and it was very well received. 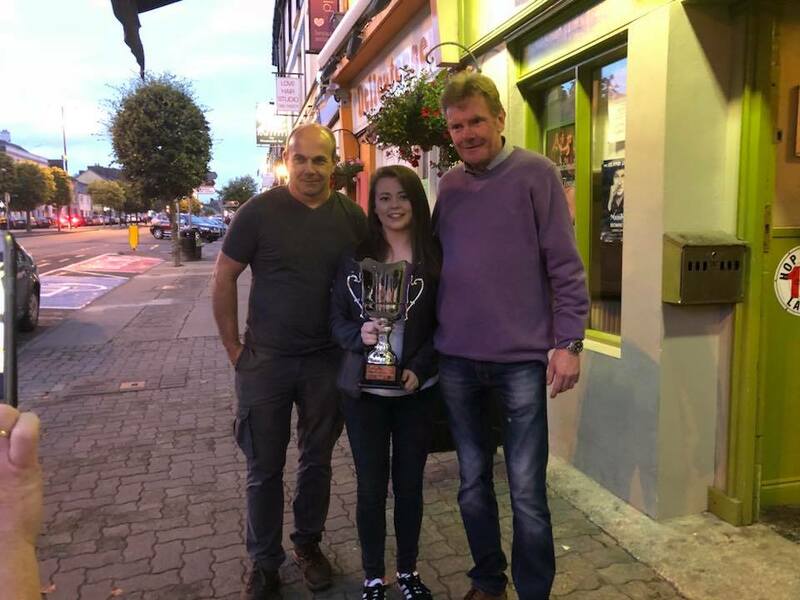 Con & Julia organized a 1/2 set & to finish off a great night Jimmy Cullinane kindly gave his recitation about Mike Kenny.